This three piece set provides an easier way to grate food, and prepare dishes with more flavor. 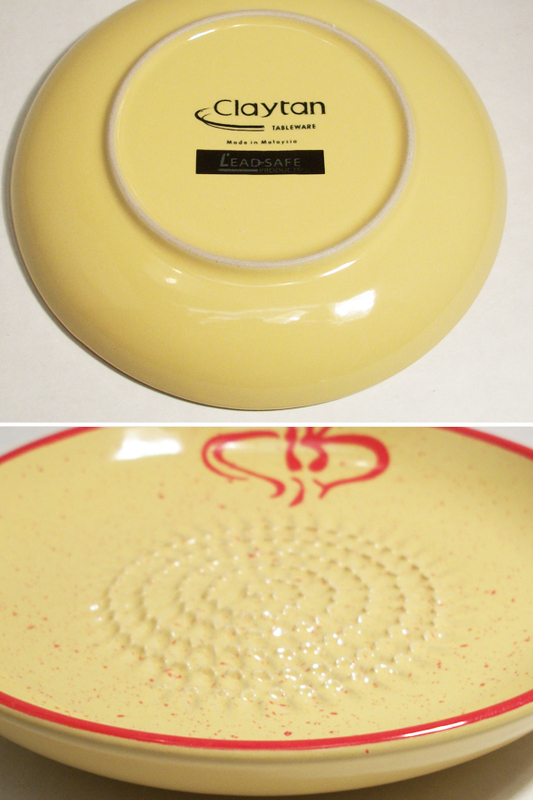 The main component is a simple ceramic plate with a colorful design, and little bumps all over the surface. It's simple to use, and offers a more efficient way to puree and grate tough foods like garlic and ginger. When you use this device instead of traditional graters and knives, you preserve flavor, use more of the food, and finish in less time. It only takes a couple of twirls to reduce a large clove into a flavorful paste, because the ceramic nubs power through food, and keep your fingers safe at the same time. Hard stuff like chocolate and ginger are normally difficult to work with, so they lead to frustration, but this plate makes them easy to grate, and allows you to produce professional quality results with very little effort. As an added bonus, the set also includes a garlic peeler so you can quickly remove skins without making your fingers smell, and a little brush to help you transfer your ingredients, or combine with oil to brush onto bread. The hand painted designs give them a great look, and the glazing all over ensures a safe surface that is easy to clean. Don't get duped by low quality versions that will only save you a few pennies. This one is larger, more durable and more effective. 1. Ceramic Plate Grater - Beautifully hand painted, and extremely effective, this lovely looking plate will quickly become your new favorite kitchen gadget. It looks good enough to display as a decoration, and it offers a better way to grate and puree all of those foods that normally cause frustration. Use it to zest lemons and oranges, grind cinnamon and chocolate, or puree fresh garlic. It's extremely simple to use, and there is no right or wrong way to use it. The entire center portion has little grating nubs, so you can move food around in circles, up and down, or even side to side. As long as you are passing over the ceramic bumps, you will be grating, so it's pretty difficult to have trouble. Because the plate has some depth to it, you can easily transform it from a grater to a dipping dish. Mince up garlic and other herbs, and then add some olive oil for a delicious way to enjoy fresh bread. 2. Garlic Peeler - This free bonus item is extremely useful, and sometimes sells for more money than we charge for this entire set. To get garlic ready to grate, you will first need to remove the peel. This high quality rubber-like tube makes it easy, and prevents you from having to pick at it with your fingers. To remove the peel prior to using the plate to puree it into paste, simply place one or more cloves inside the tube and then roll vigorously. You will want to make sure you are working on a flat, hard surface, and that you are applying downward pressure as you roll. Once the peel comes off all the way, you will be able to hear a slight crinkling sound and the job will be done. Learn more or purchase separately. 3. Pastry & Basting Brush - This handy little brush adds value to this set, but will become useful for other tasks too. It features natural bristles, an ergonomic handle, and it's the perfect size for smaller jobs. Use it to scoop up, and spread out the food that you grate in a quick and efficient manner. Once you mince down your garlic, or grate other foods like ginger, this brush will make it easy to spread onto the food you are preparing. Also great for spreading egg wash, or butter over the tops of pastries. Learn more or purchase separately. This versatile tool is perfect for garlic, but it works with a long list of other foods too. Use the examples below as a guide. The plate will grate any food mentioned, and many more. Start with the items listed, then experiment to include anything similar. Fast & Effective. Few alternatives offer the speed and precision of this one. Quickly reduce cloves to paste, or whole nuts to a fine crumble. Reduce the time it takes you to prepare food, and improve the results all at once. More To Explore. Not just a grater, this three piece set will help you with the whole process. Quickly remove the skin with the included peeler, and easily control, spread or serve the stuff you grate with the included brush. Low Maintenance. Easily clean up when you finish thanks to dishwasher safe materials. The glazed ceramic and pure silicone will not absorb odors or colors, and each will wash clean with ease. High Quality. Other versions are much cheaper when compared to this one. Avoid contaminated paints, chipping surfaces, or inferior construction when you choose our set. The plate will be larger, deeper and easier to use, and the included accessories will be of better quality to provide longer lasting performance. Cadmium and Lead Safe. With a certified safe surface that's made in Malaysia, this plate is both safe and effective. Beautiful Designs. Choose from four different styles to match your tastes or kitchen decor. Versatile. Most people get it for one food or another, but this clever device is perfect for grating all sorts of stuff. Get one to make garlic dip for your next party, or to reduce nutmeg to include in a recipe, and then get even more value by trying ti on other stuff too. There has never been a quicker or easier way to mince garlic or grate difficult foods like ginger, cinnamon and chocolate. It will take you less than half the time, and your results will be far better. When making garlic paste, you will be able to reduce cloves to the perfect consistency much faster than you can with a knife or press. Because the plate is curved, and does not absorb liquids or flavor like regular cutting boards do, you will be able to use less, and retain more flavor. Very little will go to waste, and the resulting dishes you make will be far more flavorful as a result. Stop smashing and straining with a knife only to smear half of the garlic into your cutting surface. Use this efficient tool instead, and you will finish the job quicker, but also end up with better, more professional looking results. When grating hard food like ginger root, chocolate, or hard, gourmet cheeses, traditional graters offer more of a hazard than anything. You stress and strain to grate the food, and you risk cutting your knuckles as you provide the force necessary to produce good results. With this alternative, it's much different. The strong, ceramic points do all of the work for you, and they are far less risky for your precious skin than dangerous metal blades. With only moderate pressure, and very little effort, you can grate up a pile of hard food into perfectly sized pieces. Simply spin it around the center of the plate, and the ceramic protrusions will cause a pile of grated food to form. It's just that easy, and because of the design, all of the stuff you grate will be contained within the plate itself in order to reduce mess, and eliminate extra dishes. If you are doing a large amount, just keep another receptacle handy, and the slick, glazed surface will make it easy to whisk it away, as you work. Looking for a storage container too? If you need a place to store your fresh cloves, and you also want to make them last longer, try our ceramic keeper. It comes in four styles to match the grater dishes, and the simple and effective device is the perfect compliment to this set. This set is super simple to use, so anyone will be able to grate quickly and accurately while producing professional style results. To ensure desired outcome, and ensure proper maintenance, follow the instructions below. You will find step-by-step directions for working with garlic, but any other food can be used in a similar way. From start to finish, the process will be quick and easy, and because you can grate and serve with the same dish, clean up will be fast too. To remove the peel and prep your garlic, simply place inside the tube, then roll under the palm of your hand. Once you hear the crunching sound, the skin will be off, and the peeled clove will pop right out. Once peeled, moisten the surface of the plate with water, or apply a light coat of oil. Hold the garlic in your hand using your index finger and thumb. Position it so that the root is facing up. Apply light pressure, then rub against the bottom of the dish. Use a circular motion, or swipe up-and-down, or back-and-forth. Pulp will begin to form quickly. Use the brush to gather it together at the center of the dish. For best results, work from the outside in. To remove grated/minced pulp, tip plate over and let it slide off. To make a fresh dip, leave the garlic where it is, then add olive oil and herbs on top. Plate and peeler are dishwasher safe. Hand wash brush as needed. The solid nubs are strong enough to power through any type of food, but will not hurt your fingers if you accidentally brush against them. They will remain safe, effective and unchanged for many years of useful operation, and because they are not metal like most grating tools, they will not rust, alter food, or pose any risk. You can wash by hand or put the plate in the dishwasher for cleaning, so even maintenance and clean-up is simplified when you use this tool. Get outstanding results for regular grating tasks, or use it to make fresh dipping oil for parties and other gatherings. This unique set makes the perfect gift because it is an ideal addition to any kitchen that doesn't already have one. Order Yours Today! 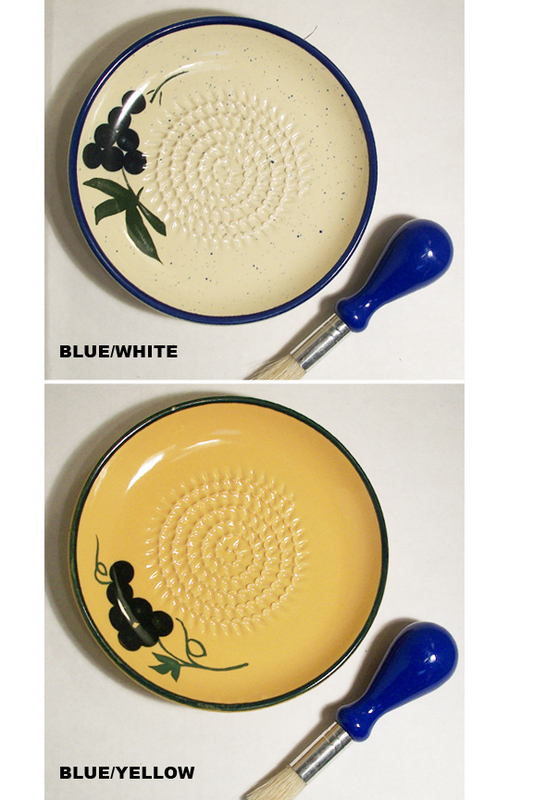 Plate Dimensions 5.25" x 5.25"
Color Your Choice: blue/white (grapes), blue/yellow (grapes), green (olives), or red (garlic). 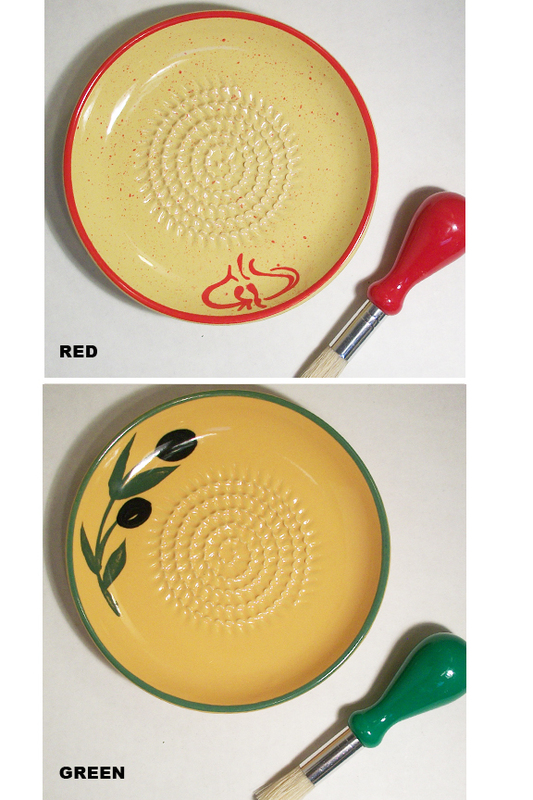 Each plate comes with a matching brush in red, green or blue. Uses Provides better grating of tough foods like garlic, ginger chocolate and more. Lead Safe Yes. Certified lead free. Design Curved plate with grating surface in the middle. Extras Included (1) Silicone garlic peeler and (1) mini nylon food brush included. 3 piece set total. Give food more flavor as you discover an easier and more efficient way to grate your food. Ideal for garlic, ginger, hard cheese and more. Set includes grater, garlic peeler and food brush. Order Yours Today! This is one handy little gadget. Garlic is minced in milliseconds and you don't lose your oils on a cutting board. EVERYTHING goes into what you're cooking. The peeler makes it a snap to clean the garlic and the plate makes it sooooo easy! a friend of mine bought me one of these as a gift and I loved it so much I purchased several as gifts for the upcoming holidays. So very pleased. This is exactly what I was looking for! And this was a terrific price! I love this grater. It’s easy and fast & I use it everyday. Received the product on time and no problems. Grater works great I use it almost every day! FABULOUS! Love it -- really "mushes" up the garlic beautifully! Gave one to my son who loves to cook and he loves it too. Product was as described and will enjoy using it. I bought a set for myself and don't know I how I managed without them. I've used it for fresh garlic, nutmeg, ginger, and cinnamon sticks. Cleans up easy. I liked so much I bought more to give as gifts. Love this product. Very helpful The price was better than I had found any where else. I bought them for gifts, and I was a hit. 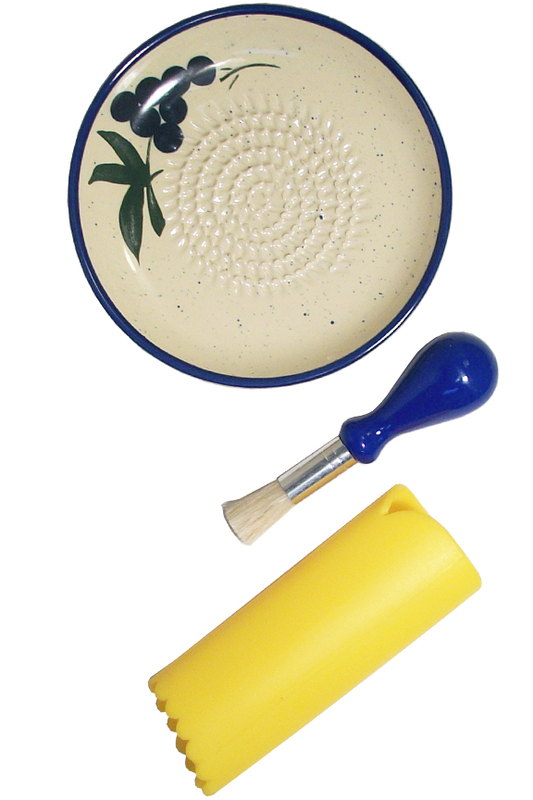 I received the garlic plate grater, brush, and the rubber roll garlic pealer as a gift. I loved mine so much I order 4 for my daughters for Christmas. When they came 3 plates were chipped. I called Simplygoodstuff and they happily replaced my chipped plates with new ones. I received the new plates yesterday and they are perfect. Thank you Simplygoodstuff for being so kind and helpful. We ordered a garlic grater dish along with the brush and rubber tube used to clean off the garlic husk. It arrived in good shape and is exactly what we were looking for to meet our cooking needs. A great little gift that works so well grating many things I really enjoy using it. Haven't had a chance to use it. I was hoping for some instructions. Not sure what the blue tube thingy is used for. I'm happy with my ginger grater. It's exactly what I expected it to be. I love the grater and it works great! But I am very disappointed that what I received is nothing like the color and style I thought I would be getting. I don't mind something a little different, but i don't like the painting print on what I ordered at all. But I guess function over beauty is fine. What a fabulous fun find! This little magic dish has made my cooking preps with garlic, ginger, cheese, so much fun! I loved it so much, I bought ten of them to share with my daughters and friends! It's a wonderful helped tool! Excellent product for the price! Easy to find and received in timely manner. We've used and now wonder why we haven't had one of these gadgets all along. I love these as I have used one for a few years & wanted them as gifts. After I paid what I thought was a good price a friend got one set for 5.00 @ a outdoor fair. Oh well-then you sent blue peeling sleeves that don't even match the dish. I guess they look miss matched. Not very matching to anyone's kitchen. Originally got this set as a gift and like it so much, I had to order some as gifts. Very happy with the purchase and the way they were shipped. Not as good as grater plater but does the job. Would prefer grater plater. I use both the cleaner and the dish as least a few times a week, planning to pick up a few extra for gifts. We bought four of these at a home show after seeing how they worked. We gave them all as a gift and wanted one for yourself ordered from this site. Shipped quickly and great product. Don't know what I did before using this. I originally bought this at a side show festival. I absolutely loved it. When I showed my friends they all wanted one, so for Christmas I hunted them down via internet. They seem the same although the points on the plate are not as sharp as the one I bought in the summer. And the design is limited. But they do the same job! Everyone loves it. I ordered this one for a friend because I love the grater and the tube to shed the skin on the garlic (what a clever invention). I will recommend this to anyone who is a garlic lover. The only problem with mine (which my daughter sent to me) is the brush fell apart. But a toothbrush works just as well. I love the idea of this pretty dish allowing one to grate fresh garlic then serve right at the table by adding olive oil for dipping bread. The garlic peeler is ingenious and easy to use, as well. The brush is handy for getting into all the nooks and crannies of the dish or for spreading the oil mixture into bread, if one would rather. The "great" thing about this grater is its versatility in being able to grate anything one would want to grate...chocolate, cheese, carrots, etc. These made unique,helpful and appreciated gifts. I received a similar plate grater for a gift last Christmas and loved it. I wanted to give some to others for gifts but when I saw the price online I was surprised they were so expensive. I found these plates on the Simply Good Stuff website at a very good price so I ordered 3 of them without boxes. When they came, I liked them so much that I ordered 4 more. This time I ordered them with boxes. The boxes are very colorful and help to illustrate what the kit is. Seeing this, I called to ask if I could order just 3 more boxes and the Company sent them. These plate sets are very nice at a wonderful price and this is an excellent, very customer friendly company. I love the product!!!!! Now I do not waste any of my garlic. This little ceramic plate grater is just the best thing since sliced bread. I love to use it and have increased my consumption of fresh garlic and ginger just to have the opportunity to mince them on this wonderfully designed grater. The garlic peeler makes preparing the garlic for mincing a delight vs a time-consuming, somewhat frustrating chore. They are my most used kitchen gadgets. The graters arrived quickly and safely. Love the color I chose. I have two sets put away for my girls for Christmas. And I'm already using mine. Great product! simplygoodstuff response: It sounds like you may have received a defective one. Sorry to hear that. We don't usually encounter any chipping or breakage with this product, so please give us a call and we would be happy to send a replacement. I have loved the plate grater and the garlic peeler. The brush that cam with the set, however, seems sub-standard. The bristles are constantly falling out as I try to use it to gather the garlic. For the price I paid, this is still a good deal for the other two items and they seem to be good quality. I looked for this three piece set. I had purchased a couple at a State Fair years ago and wanted one for a family member. It works great (no pun intended) and a good price. The plate itself is made in Malaysia. The two accessories are made in China. Will I get the plate that is depicted? Does all 3 pieces come in a box together? Please view the additional pictures to see all styles available. We currently have four specific styles that you can choose from. When selecting a specific style, it will look pretty much identical to what is pictured. Due to the nature of the product, there will be slight variation in color or imagery. In most cases, the sets will be individually packaged. At a certain quantity, we may switch to bulk packaging. If you are ordering a large number, please let us know if individual packaging is important to you. The set is currently packaged in a clear plastic, retail-style container. Graphics and instructions are included on a card inside the packaging. They are nice for extra protection and gift-ability. To see the styles we have available, scroll up to view all pictures above. As of today, we are offering four different choices. If you are unsure of what you will receive, please give us a call to order by phone. Do you have any other choices then just yellow and Orange dish? Yes. We have some with more of a white center, and some with a center that is more yellow. For accent coloring, your choice will be green, red or blue. What colors do you have? can you send a photo of them? All colors and styles currently available are depicted in the photos above. If you are unsure of what you might receive, please give us a call to order over the phone. Similar to any other hand painted ceramics, it is recommended to hand wash, but also safe for the dishwasher. Is it safe with the hand painted surface? and is it glazed? Yes it is glazed, and equally safe when compared to any other ceramic or pottery item.If you flip the plate over, you'll see that it is stamped to certify that it is lead safe. It's totally food safe and washable. How does one do the grating without injuring his fingers? I understand how to peel the garlic, but I am not sure about how to do the grating. Please advise. Thank you. It seems more dangerous than it is. 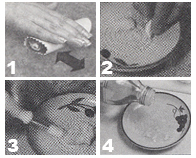 The process is really easy, and the little bumps aren't able to cause much damage to your fingers. Just hold the chunk of garlic with finger and thumb, then apply light pressure and move around in circles, or back-and-forth. Because you don't need to press down hard, there is very little risk of slipping, or hurting yourself. Double Duty! A Course and Fine Grater In One. A Rotating Grater For Cheese, Chocolate, fresh bread crumbs & more.